Good alcohol is art. Whether the medium is an amber-hued craft ale, a smokey, peaty Isle Scotch, a complex and subtle Willamette Valley Pinot, a tasty Tanqueray and tonic or any of thousands of other choices, a good drink can be downright sublime. In recent years, Barbra and I have become fans of that quintessentially American spirit, bourbon. Although our favorite has been Knob Creek, a recent article on bourbons in Wine Spectator got us thinking that it would be fun to try other makes. And so, as this weekend finds us in Anchorage, last night we engaged ourselves in a blind taste test of four bourbons. The Crow’s Nest in the Captain Cook Hotel offers commanding views – of a blazing orange sunset over Cook Inlet on one side, of city lights waking and twinkling against the enveloping dark on the other. The bar carries a nice selection of bourbons, and with plenty of empty seats when we arrived, our bartender was happy to indulge us. We were keen to do a side-by-side of two popular brands: Maker’s Mark and Knob Creek. Past that, we were open to anything. “I have a couple I think you’ll find interesting,” she offered. So while we took in the nighttime views out the floor to ceiling windows, she surreptitiously poured out four measures of bourbon in attractive tumblers, arranged them at the bar, and motioned to us that our taste test was ready. After a round of sniffing, sipping, swirling and comparing impressions, we agreed on our order of preference. 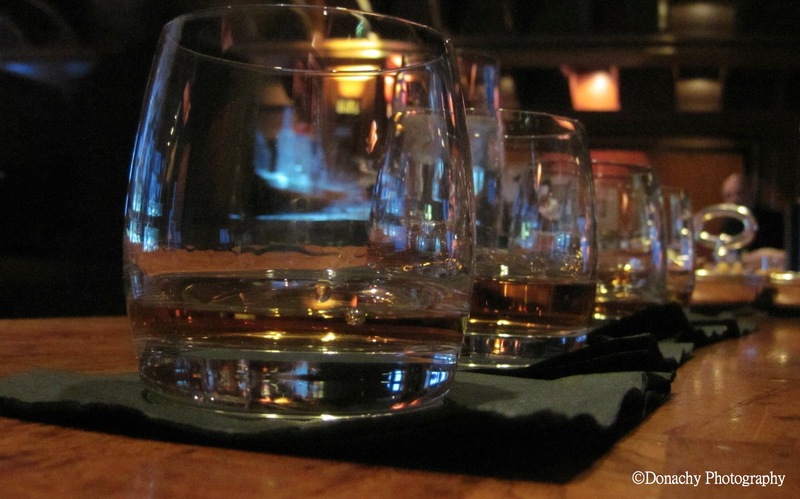 We repeated the test one more time, letting our noses and taste buds explore for anything we might have missed the first time around, after which we called our bartender over to reveal which bourbons were which. The results surprised us. Maker’s Mark, it turned out, was, hands down, our favorite. We found it to be smooth, light on our tongues, and a little sweet in a very agreeable way. Hints of carmel apple reminded me of autumn days in the western Pennsylvania mountains of my youth. We also found notes of sweet cream and vanilla and a clean finish that invited the next sip. Our second choice – again by a clear margin over the remaining bourbons – was Knob Creek. This whiskey has a rich amber-red color, and a nice nose. Although we both wanted it to have a fuller finish, like Maker’s Mark this drink has a light roasted sweetness that, for me, evokes autumn leaf festivals and cool evenings warmed by oakwood fires – the image of the oak fire no doubt prompted by the subtle oakiness of the whiskey itself. Although we went back and forth on the next two drinks, in the end we settled on Blanton’s. We found this bourbon to be crisper – less sweet – than the previous two, drier and, perhaps, a bit lighter. Certainly very enjoyable. Basil Hayden’s has a distinctive rye taste that, perhaps, with more experience with bourbons we might come to appreciate but, for now at least, comes off a bit fumy and and a little overwhelming. I can imagine that if one did develop a taste for Basil Hayden’s, the characteristics of the rye could be satisfying indeed. Perhaps an analogy could be made with single malt Scotch. In our view, there are no “bad” single malt Scotches, but often times there is nothing quite as satisfying as a couple fingers of Laphroaig with all its up front peatiness and smokiness and its sherry undertones. I’m not sure what it says about us, that our preferences in bourbon were the exact inverse of the pricing. I guess we’re still a couple of cheap dates! And we incidentally made another discovery. 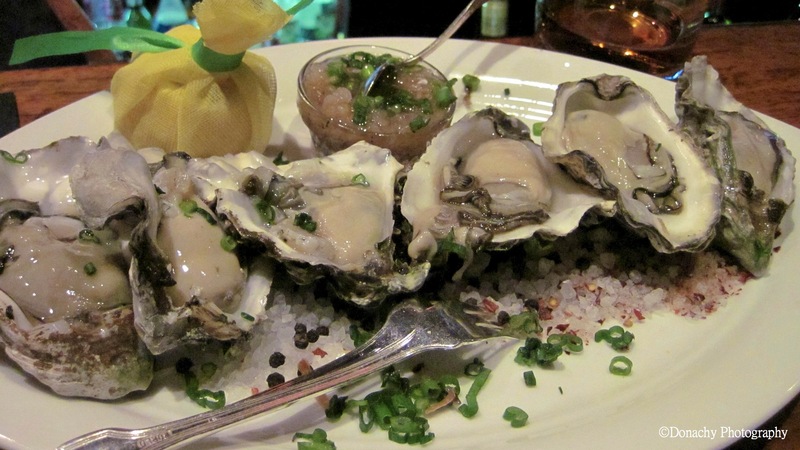 Bourbon is a fine compliment to oysters on the half-shell and would probably pair well with other seafood as well. We splashed a little Blanton’s on these delectable oysters and enjoyed them with a round of Maker’s Mark.